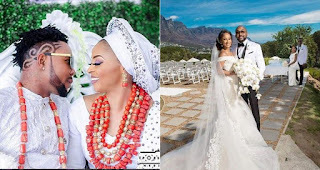 Oristefemi and BankyW’s much talked about wedding has come and gone but many fans still compare the two weddings in terms of class and taste. Surprisingly, when Sources reached out to the self-acclaimed music Taliban, Oritsefemi, he said that there was no basis for comparison. The Double Wahala singer added that his wedding trended on Twitter as such, no one could say that Banky W’s wedding outshined his. I have no issues with both of us getting married on the same day, if anything; it was more fun because like they say, the more the merrier. I was the one that got married and I am not even doing any form of comparison. All I wanted was to have a classy wedding and I got that at the end of the day. “Banky’s wedding did not outshine mine. Although I did not follow what was happening on the social media, I was told that my wedding trended on Twitter. I feel it was more fun for us that we got married on the same day and we were keeping people busy on the Internet. The Internet almost went crazy for both weddings. I don’t see any problem with it.